stylos: Phil Johnson on Mark Driscoll's "Pornographic Divination"
Phil Johnson on Mark Driscoll's "Pornographic Divination"
The Reformed Baptist Fellowship blog recently called attention to an August 15 post by Phil Johnson on the Pyromaniac's blog titled "Pornographic Divination." 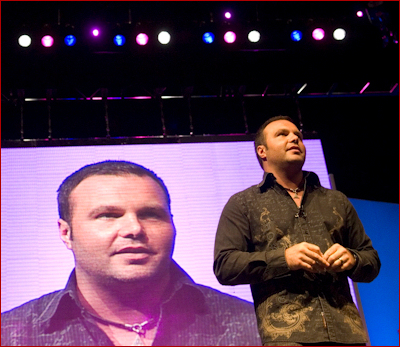 The post has a clip of Mark Driscoll describing lurid visions he claims to experience. The clip is disturbing. It makes clear that Driscoll's view of the ministry is not in the realm of the orthodox. I did a message a few years ago reviewing Driscoll's ministry at the request of the Society for Baptist Principles and Practices in Roanoke (listen here), in which I raised concerns about the non-cessationist views of Driscoll. Driscoll has been known as "the cursing preaching." I learned about him for the first time from a young man who was then a recent graduate of Southern Seminary and who gushed about Driscoll's ministry. He loaned me the two books written by Driscoll I that I read and used as the primary basis for my review. Driscoll remains popular on the YRR scene. He speaks at Gospel Coalition events and has done conferences at Southeastern Baptist Seminary. His Acts 29 network is promoted by YRR parachurch groups like Together for the Gospel and the 9 Marks ministry. Johnson's post ought to serve as a chilling caution to those who have embraced and promoted Driscoll's ministry. Why are we surprised at his extra-Biblical notions, given the very name of his movement, "Acts 29"?